As you can see via Instagram, Tony and I have been grilling up a storm this summer. In fact, we been grilling on our deck nearly every night while our adorable little cat Milly watches and meows outside the window. We call it family night. Hah. If you’ve been following AK for a while now, you know that my boyfriend is in love with meat, fries and pizza. On the other hand, I’m fond of spinach, avocados and nut butters. It’s an odd little combination but we love and accept each other’s need for particular foods, often planning meals around each of our individual cravings (like these healthier baked fries!). In an effort to keep Tony satisfied with his meals in addition to the both of us eating healthy, I created this tasty grilled healthy chicken burger recipe! 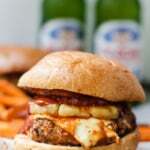 The burgers are jazzed and flavored with my favorite basil pesto and Go Veggie mozzarella shreds. Add a fresh, juicy tomato slice on top and you’ve basically got yourself a caprese burger. Or also known as a really dank burger. 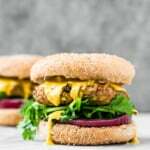 I used Go Veggie mozzarella in this recipe; the slices are wonderful because they’re actually lactose free, so even those with sensitivities can enjoy a little cheese on their burger. 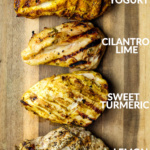 If you’re like me and prefer chicken over beef, then it’s time to grill these babies up over the weekend and chow down. For me, chicken and turkey are better choices because they’re lower in saturated fat and a great source of lean protein. 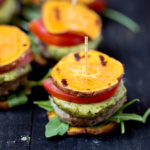 Wonderful healthy chicken burgers with a homemade basil pesto, mozzarella and all the toppings your heart desires! 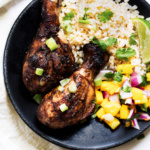 Grill them up and chow down! First make the pesto: Add spinach, basil, lemon, olive oil, nuts, parmesan cheese and garlic to the bowl of a food processor or high-powered blender (such as a Vitamix). Process until smooth. Add 1 tablespoon of water to thin pesto if necessary. Season with salt and pepper. Set aside. Preheat grill to medium high heat. Lightly oil grill grate. In a large bowl, add the ground chicken, 2 tablespoons of pesto, 1/4 teaspoon of salt and pepper. Use your hands to mix the ingredients together and form into 4 patties. Place burgers on the grill and cook for 5-7 minutes per side or until done. Top with cheese and grill 1 minute longer or until cheese is melted. Serve each burger in a bun or lettuce wrap and top with 1 tablespoon of pesto, plus any additional toppings you might like such as avocado, onion or tomato. Nutrition for burgers do not include buns or extra toppings such as tomato, onion or avocado. This post is in partnership with Go Veggie, a brand I trust and have partnered with for over two years. Thanks for supporting AK and the brands that help make this site possible! 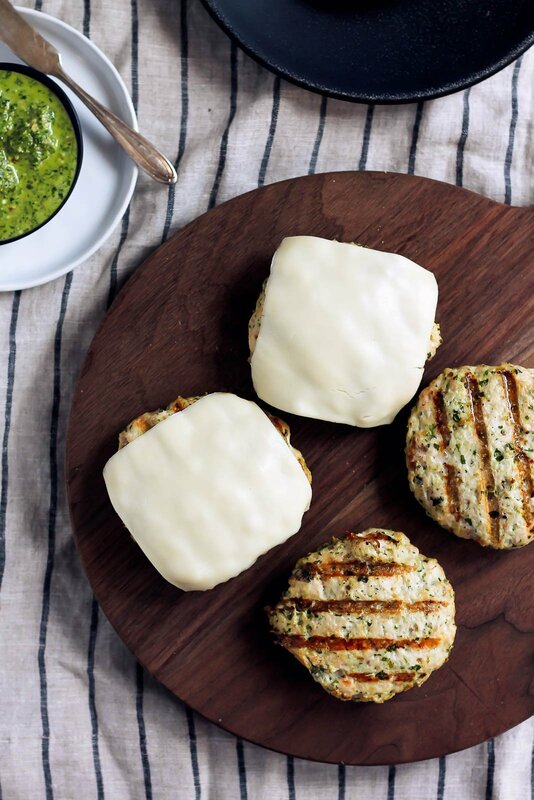 25 Responses to "Healthy Chicken Burgers with Spinach Basil Pesto & Mozzarella"
If you want to keep the pesto dairy free too, a scoop of nutritional yeast works great. I usually prefer chicken over beef and have yet to make pesto this summer, so I need to try this recipe! It looks delicious! These look absolutely delicious! 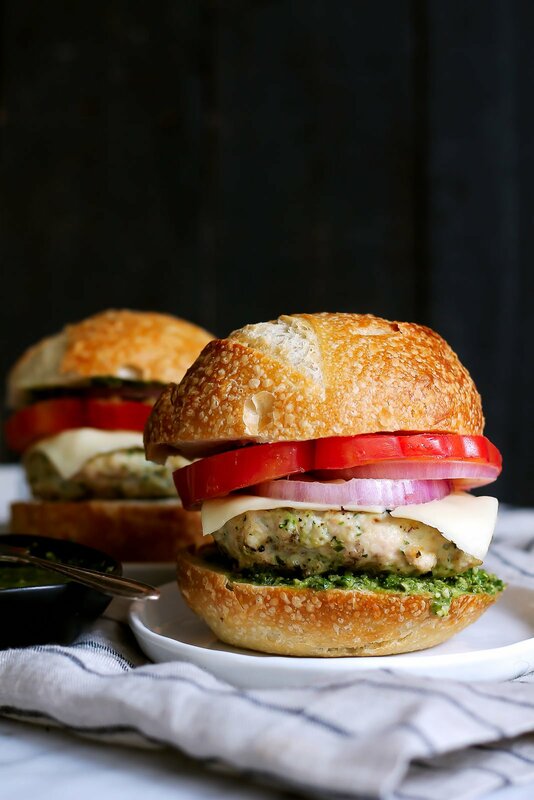 I love the idea of pesto with chicken – a classic and a great way to make the burger juicier! Interesting that you have the nutrition info next to the recipe. Oh my gosh I want these for dinner tonight!! Where are the buns from!? I second this question! They look incredible!! They are sourdough buns from Whole Foods! Loved these! Used ground chicken and everyone enjoyed them. Thanks. These look amazing! I may have to try these for tomorrow breakfast. I’m glad you enjoyed, Nancy! It is some kinds of great recipe to try. My friends and kids will love it. Thanks for your sharing. I will be back with reviews. I will make two versions. One with the original recipe, and one with additional ingredients to compare. Perfect! Hope everyone loves this one! FYI – This recipe is also very Keto-friendly for those who are counting…I made these tonight for my sister-in-law. Just use the lettuce wrap instead of a bun (we did Romaine hearts), and topping with avacado lends the fat that Keto calls for. She raved over them! Perfect! Love the idea of using lettuce wraps 🙂 glad you both enjoyed!